This map shows Eversource's combined service area with Aquarion. The energy company now wants to buy Connecticut Water, in a move it says would complement its Aquarion merger. Eversource is currently trying to buy its second water company in the past year. The region’s biggest electric utility hopes to provide water service to hundreds of thousands of customers across four New England states. It would still be a small swath of the overall water system – but that could change. But why do electric companies want to get into the water business? In 2015, publicly regulated electric utilities were being deregulated. It meant Eversource couldn't own power plants as well as the poles and wires that bring that power to customers. So Eversource agreed to auction off its power plants – but it lost money on the deal. Now, customers are paying them back for those losses in the “stranded cost recovery charge” on their electric bills – anywhere from a few cents to several dollars a month. New Hampshire’s utility ratepayer advocate Don Kreis says, long-term, those charges will work out to about $600 million dollars for Eversource to spend. Last year, Eversource used some of the money from selling its power plants to buy Connecticut-based Aquarion, the biggest private water company in New England. The merger was worth nearly $1.7 billion. Eversource says it made them the first and only American electric company to also own a water utility. Eversource spokeswoman Caroline Pretyman says water is a natural fit for their business. It’s regulated like electricity and gas, and all those sectors are focused on infrastructure. Eversource has to keep its water affairs separate from its electric and gas affairs, in spending and in regulation. Still, Pretyman says they’re investing heavily in Aquarion. And they’re not done expanding into water yet. Right now, Eversource is competing to buy Connecticut Water, which is also a big player in several New England states. Pretyman says the purchase would be an investment – above and beyond the funds from the sale of the company's power plants. Eversource’s main competitor in the attempted Connecticut Water merger is California-based SJW Group. If SJW buys Connecticut Water, they’ll form the third-biggest water company in the country. And the two companies aren’t strangers: SJW’s CEO Eric Thornburg was Connecticut Water’s CEO until last year. He recently told utility regulators in Connecticut that he has local knowledge, and his new company has industry expertise. Connecticut Water is taking other merger bids until July 14. After that, their shareholders will pick an offer – from Eversource, SJW or someone else – to submit for state approval, a process that could last into next year. Eversource’s offer is worth a little less than SJW’s, but Pretyman, the spokeswoman, says Eversource can offer more true local control. 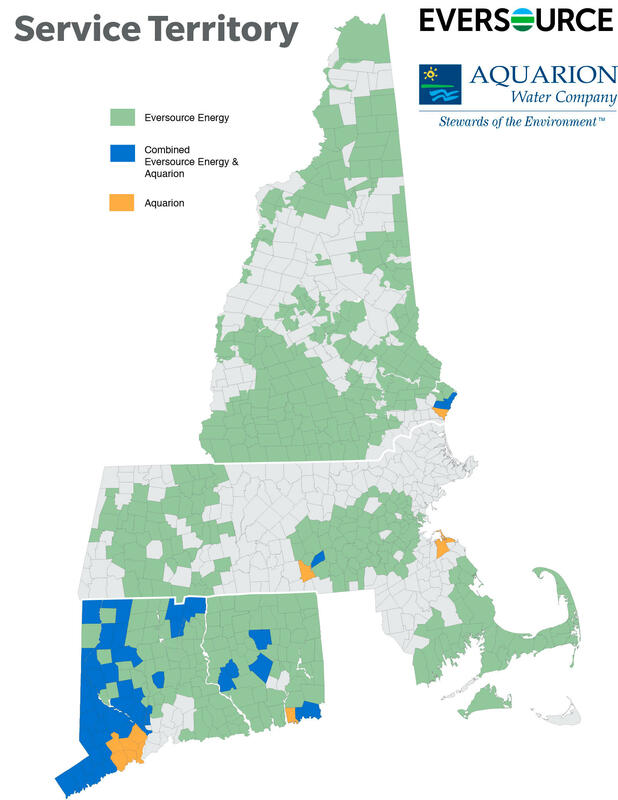 Still, Eversource is far from a small, local water utility. The company has nearly 4 million gas and electric customers, more than any other New England energy company. Don Kreis, the ratepayer advocate in New Hampshire, says these forays into water mean a step away from diversity, toward risky consolidation. Critics of Eversource’s expansions, like Congressional candidate and New Hampshire state representative Mindi Messmer, a Democrat, feel like they’re already running into that problem. Last year, Messmer tried to block Eversource from buying Aquarion. The electric company has a small role in a legacy water contamination issue on the New Hampshire Seacoast. Messmer suspects that contamination has affected an Aquarion well. New Hampshire environmental regulators don’t believe that’s true. But Messmer doesn’t like having to worry about it at all – because she says water plays a different role in our lives than electricity. “Nobody wants to have to worry about, when they turn their tap water on, what is going to come out of that, whether it's safe for their children and their families,” she says. Messmer says Eversource’s entry into the water space erodes local control of that essential water system. She’d rather Eversource lower people’s bills than buy up more water companies. But if she had to choose, she says she’d pick Eversource to buy Connecticut Water over the California competitor. It’d put control closer to home – just not as close as she might like. WNPR's Harriet Jones contributed reporting from Connecticut. This story was produced in partnership with the New England News Collaborative, eight public media companies coming together to tell the story of a changing region, with support from the Corporation for Public Broadcasting.